Our award-winning Patak’s Spice Pastes are our pride and joy. They are a blend of high quality, specially selected spices from an original family recipe. Because the spices are ground and blended in the perfect quantities, you can create authentic Indian dishes in no time at all. Mumbai-born chef and writer, Maunika Gowardhan has developed four recipes using our Spice Pastes to help you to bring the authentic flavours and aromas of India to your kitchen. Maunika loves sharing simple recipes that have been passed down in her family for years, much like us. She thinks food is the perfect way to bring people together and encourages everyone to explore and embrace the flavours of the sub continent whether through her cook books or by cooking and teaching with the great Jamie Oliver! Maunika’s recipe for Parsi Prawns Patia is based on a traditional dish from the Parsi community that her family has cooked for decades. Maunika adds a touch of tamarind paste and sugar to the chilli, cumin and coriander of our Balti Spice Paste to give an authentic balance of flavour. Our Madras Spice Paste with fragrant spices, black pepper, chilli and garlic is a great way to bring heat to your Indian dishes. Maunika uses it in her recipe for Tamil style Kozhi Varavul, a tasty twist on a chicken stir fry. We love Maunika’s recipe for Tandoori Gobi. This dish of whole-roasted spiced cauliflower is her favourite snack. The cauliflower is marinated and basted in our Tikka Masala Spice Paste. Its blend of 13 spices - including turmeric, coriander and paprika transforms the flavor of this humble vegetable. Maunika’s Sabz Gosht is the perfect weekend warmer. This delicious slow cooked lamb dish is packed with paprika, fennel & black pepper from our Rogan Josh Spice Paste, making a comforting and flavoursome curry. Try her recipes today and bring the authentic regional flavours of India to your kitchen with Patak’s Spice Pastes. Cauliflower is most definitely having a moment. And what better way to eat it than marinated with Patak’s Tandoori Spice Marinade, yoghurt and fresh herbs & spices! The whole cauliflower is coated in the mix, roasted in the oven. Basted with a spiced chilli butter to keep it moist until it’s cooked all the way through and served topped with pickled onion & mint raita. The quickest way to get a delicious patia for your dinner has got to be with this gem of a recipe! This is a traditional dish hailing from the Parsi community and one that families have cooked for decades in Mumbai. All the goodness of the spices comes from just a few tablespoons of the Balti paste which flavours the patia with chilli, cumin & coriander. The addition of tamarind and a pinch of sugar gives you the perfect balance of flavour to this sweet and tangy dish. 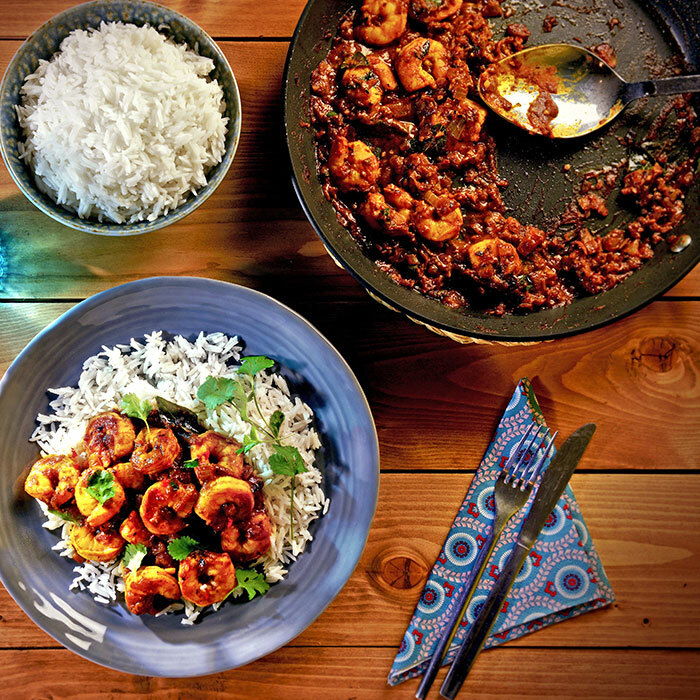 Prawns are quick to cook and make a delicious addition to this recipe. Awadhi cooking originates from the modern Indian state of Uttar Pradesh, as well as some areas of Nepal. However, it's now so fashionable that it has spread far & wide across India. This is a delicious, rich lamb curry cooked with onions, Patak’s Rogan Josh Spice Paste and vibrant green vegetables. The slow cooking helps the spices in the Patak’s paste seep into the lamb and release their flavour into the curry.